Step into the deep rainforest and experience a trip like no other when you try this Ayahuasca kit. This kit features two premium quality psychoactive ingredients that allow users to transcend this world and enter into world and different eras of time that exist simultaneously alongside ours. Easy to Prepare. All it really takes is some boiling and time to prepare this concoction. Just take a look at the more detailed instructions provided (although it’s extremely easy!). High Quality, Whole Leaves. All our leaves are collected every early in the morning then left to dry in the shade. This is done to protect and preserve the magic qualities of the leaves. A Rite of Passage. This of this experience as a rite of passage. In Brazil, this is drunken by people who enter adulthood or special occasions. It’s a perfect bucket list item. Perfect for a Quiet Night In. Forget about going to the club and instead have a mystical night with friends and trusted people. Embark on your journey within! A Must Try For Spiritual individuals. If you consider yourself a spiritual person and want to find the connection between your soul and many other souls in the universe out there, then this Ayahuasca kit is perfect for you. Ayahuasca is a powerful drug that allows your reality to be completed shifted and turned into a direction you least expect. Discover the intense effects of Ayahuasca and order now! Diplopterys cabrerana (Chaliponga) Exelent quality, very potent, collected only in the early mornings, and also dried to its optimal point. Always very fresh smelling and green leaves ! A pure water source such as distilled of filtered water is important because excess minerals may inhibit the effectiveness of the brew. The pH of the water should be between 4 and 5. This helps the alkaloids become more soluble. This can be done by adding ascorbic acid in the form of ground up Vitamin C pills or lemon juice. It is very important to grind or pulverize the plant material as fine as you can and gently boil (do not let it cook) the plant materials between 4 and 12 hours. Strain and save both the water and the plant material. Put the plant material back into new pH adjusted water and repeat the whole process. Continue this process until the new water doesn't change color anymore. Then mix all of your boilings and boil it down to a more drinkable quantity. In any case, the resulting liquid is boiled down to a small, drinkable size and drunk on an empty stomach. Ensure the Ayahuasca is not boiled too vigorously, as this will cause degradation of the active ingredients and will also cause caramelisation of the contained sugars, resulting in a very thick final brew. Ayahuasca or anahuasca can be very dangerous when combined with certain foods or other psychoactives that are totally harmless when taken by themselves. Ayahuasca is not a party drug. Use it in a quiet, familiar environment, preferably with a sitter, a sober person that can take care of you. Do not use when pregnant, lactating, depressed, psychotic, operating motorized vehicles or heavy machinery, or in combination with alcohol or medicines. Not to be used by minors. Be gratefully for the experience, Independently of how it turned out. There are always lessons to be learned, if it worked or not, if you had a “good or a “bad” trip! 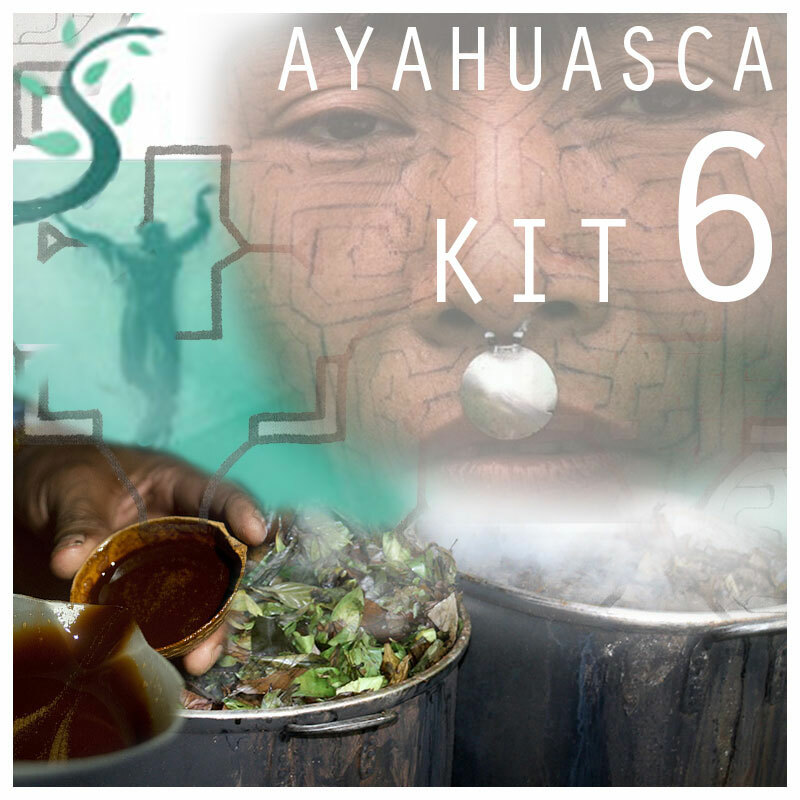 Share your experience about Ayahuasca Kit 6 with other customers. Submit your tips or thought on this product, be detailed and specific.